The sight of a well-known author who was in the company of a popular actor was so common in West Los Angeles that it normally would not trigger such a head-turning moment. 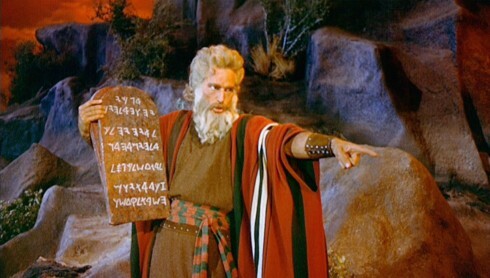 But when I spotted writer Jonathan Kirsch and actor Charlton Heston in the same contingent, I quickly remembered that Kirsch was the author of a biography entitled Moses, A Life; and here he was rubbing shoulders with the actor who had portrayed the Old Testament prophet decades earlier in the movie, The Ten Commandments. That particular scene represented the very essence of the intersection of the worlds of literary and popular culture—a setting that plays out often in the city where I live. Charlton Heston as Moses in "The Ten Commandments"
The stereotypical depiction of the cultural deficiencies of this city has traditionally offered social historians and comedians plenty of great material. But just so you naysayers understand—there is indeed intellectual life here—we just keep it a tad more concealed than in that other metropolis back east. Woody Allen once famously said “I don’t want to live in a city where the only cultural advantage is that you can make a right turn on a red light.” And if we’re totally honest here, there is considerably more material where that one came from. I will admit to my fascination with the flirtation between diverse cultures which have co-existed in Southern California for many years. Both entities—the world of fine arts and the popular culture of entertainment— seem to have an unrelenting envy of the arena in which the other abides. Each seems to desire a portion of notoriety the other holds, and therein lies a certain tension and self-consciousness that is palpable at their point of intersection. During my many years of haunting the aisles of Dutton’s Brentwood Books, I was always intrigued by watching various movie stars worshipfully following Doug Dutton around the store while asking his advice on which book they should be reading next. It was as if they had morphed into the very same groupies who desperately sought an audience with them. The celebrity role had been reversed as the entertainer suddenly needed the counsel of the esteemed literary voice. What was so intriguing about the entertainment world that brought some of America’s most successful and respected writers to Hollywood to try their hand at screenwriting for the movies? Great novelists like Faulkner, Hemingway, and Fitzgerald were all seduced by the magnetism of the big silver screen and came here perhaps seeking a more glamorous type of fame in the process. Many critics from the literary establishment of that era considered their involvement in screenwriting nothing less than a huge commercial sell-out and an embarrassing compromise of their considerable writing talents. 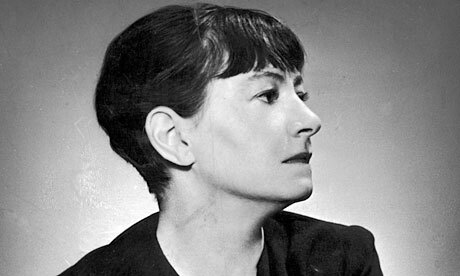 Even the irreverent satirist Dorothy Parker lived off and on in Los Angeles for almost 30 years after the regular meetings of the Algonquin Round Table ceased in New York City. She loved attending parties in Santa Monica Canyon with Clark Gable, Elia Kazan, and Tennessee Williams at the homes of local writers like Christopher Isherwood and fashion designer Jo Lathwood. Occasionally, the opposite ends of the cultural spectrum were even united in marriage. Perhaps the most famous couple from dissimilar backgrounds who eventually married was actress Marilyn Monroe and Pulitzer Prize winning playwright, Arthur Miller. No one could quite explain the intriguing union back then, or in retrospect—even decades later. However, there were considerably happier marital outcomes than that of Monroe and Miller. I can think of several marriages which might have been second-guessed, if judged only on the surface of couple’s backgrounds. My longtime friends, Marvin and Kathy Zuckerman, are the perfect example of a couple who seemingly came from two different worlds, but after having spent more than a half-century together, one might speculate that this is working out rather nicely. Long before Frankie and Annette’s beach movies, there was Gidget—and Kathy Kohner was the young teenage girl who had broken the fraternal ranks of the surfing culture in Malibu in the 1950s. 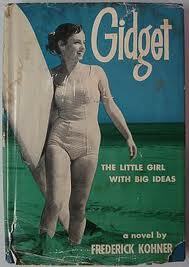 Her short-lived beach life became the basis for her father’s eight best-selling Gidget books and subsequent movies. When Marvin and Kathy eventually met, the young Yiddish scholar and English professor admitted that he had never heard ofGidget. They began a romance that broke the stereotypical profile of the traditionally matched couple. Marvin retired more than a decade ago as Dean of Academic Affairs at Los Angeles Valley College and is the author of seven books. He is now a literary agent and owner of The Courtland Literary Agency. As Kathy continues to promote the branding of “Gidget” and the ongoing sales of her late father’s book, any attachment to the stigma of beach culture might be somewhat misleading about her background. Her father, Frederick Kohner, was a Czechoslovakian-born writer whose Gidget books overshadowed his distinguished writing career. Her uncles, Walter and Paul, were successful Hollywood agents who represented many accomplished authors among their clients. Kathy was once a high school English teacher and worked at a Westside bookstore for a number of years. So, her eventual connection with husband Marvin is a bit less surprising than one might assume at first glance. The series of Gidget movies became huge box-office hits about the same time as the Beach Boys’ music splashed upon the scene. The Beach Boys hit songs like Surfing USA, which celebrated the Southern California lifestyle, began sweeping the country in the early 1960s. The potent combination of those two forces created a firestorm of renewed interest in Southern California’s beach culture as a carefree place of fun in the sun. While California’s “Land of milk and honey” motto had begun to fade, Gidgetmovies and the Beach Boys’ music rejuvenated the California image as a symbol of the nation’s youthful playground. Several years ago, Marvin happened to be involved in an impromptu encounter in my local village, and it remains perhaps as one of my most memorable illustrations of the juxtaposition of L.A. cultures. As I was leaving a local coffee shop in my neighborhood, I spotted an old friend who invited me to sit with the group assembled at his table. Greg introduced me to his friends, whom I correctly assumed were members of the crew of his hit television show,Baywatch. 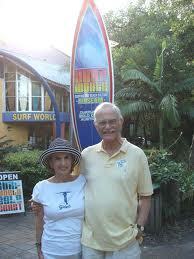 I had known Gregory Bonann back in his days as a lifeguard on Santa Monica Beach. He was a former award-winning documentary filmmaker long before he created one of the most widely-watched shows in television history. His action adventure series centered on the lives of Los Angeles County lifeguards and featured the celebrated Southern California beach lifestyle known throughout the world. He introduced me to several crew members and two beautiful young actresses who were stars on the show. As we were chatting, I inadvertently looked over my shoulder at the table next to us and was greeted by the smiling face of my old friend, Professor Zuckerman, who was sitting with his own small entourage. He nodded, and waved me over toward his table. So after exchanging parting pleasantries, I took my leave of Greg and the Baywatch crew. Marvin introduced me to three visiting scholars from Israel who had arrived in town and were participating in a lecture series at UCLA on Yiddish translation. It occurred to me that the assembled talent at this table had collectively written enough books between them to fill the shelves of my small den library. As I visited with the internationally renowned scholars Marvin was hosting that day, I couldn’t help but notice the quick curious glances between the members of both groups in which I had joined—one of them, well attired in suits and sport coats, while the other—clad in beachwear ranging from baggy shorts and flip-flops to bikinis covered by mid-thigh length tee-shirts. I also spotted one of the beautiful young blonde actresses occasionally smiling coquettishly at one of the older, distinguished professors. As I stood to leave the coffee shop, I found myself in a hovering maneuver between the two tables and momentarily considered the dubious challenge of introducing both parties before I departed. I was suddenly intrigued with the idea of “international academia meeting the Baywatch babes.” I considered tempting fate. However, I suddenly began to imagine the possible implications of the careless gesture of introducing the esteemed Israeli professor to the actress—with the looming fear of the two of them eventually eloping to Las Vegas and subsequently creating a potentially explosive tabloid moment. This scenario had international incident written all over it. Was I possibly on the verge of destroying two careers with my simple introduction? Was I testing destiny’s outer boundaries? I told myself—just walk away! I refused to be held accountable for what happened there after I left the premises.